What is a Pallet Rack System, and What Are My Options? | S. W. Betz Company, Inc.
What is a Pallet Rack System, and What Are My Options? 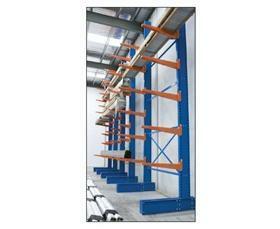 A pallet rack system is one of the most common storage systems found in warehouses and industrial facilities today. It works by providing storage space on a set of pallets, also known as skids. The benefits of pallet racking include its ability to provide layers of storage and organization, and its ability to be seamlessly loaded and unloaded using a forklift truck or pallet jack. These are the fundamentals of a pallet rack system, but there are a few different options when it comes to pallet racking, and depending on your facility, some options may work better for you than others. The main benefit for a push-back racking system is its ability to increase storage density, so if space is a concern, this is the storage system for you. It also can increase pallet count without having to worry about a negative effect on selectivity. Without the use of aisles like traditional systems, drive-in pallet rack systems maximize storage space. It works on a first in, last out system to best utilize available space. Similar to drive-in systems, gravity flow systems eliminate the need for aisles. They work by using gravity to move product down a track of metal rollers. This is also a first in, first out system. For facilities with high volumes of product or items to move, carton flow systems work best. They work similar to gravity flow systems by utilizing a track and gravity to move the items along. A traditional pallet racking system isn’t properly-sized for some things such as lumber or any long, oddly-shaped objects. They are the quickest system for storing products in these situations and can often be found in lumber yards or plumbing warehouses. With so many options, it’s easy to be unsure about which system to install for your facility’s needs. Contact S.W. Betz for help deciding which system your warehouse can benefit from most. This entry was posted on Thursday, March 10th, 2016 at 11:00 am. Both comments and pings are currently closed.